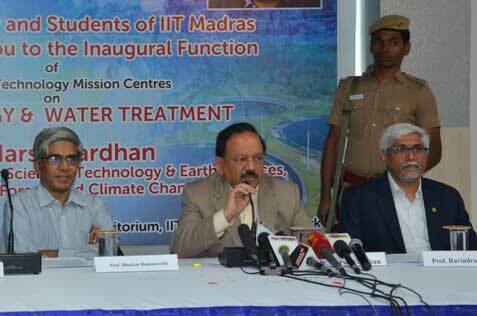 Chennai: Union Minister for Science, Technology & Earth Sciences and Environment, Forests & Climate Change Dr. Harsh Vardhan today (25th Jan 2019) launched three Department of Science and Technology’s (DST) Mission Centres on Solar Energy and Water Treatment at Indian Institute of Technology Madras. Ø DST -IITM Solar Energy Harnessing Centre. 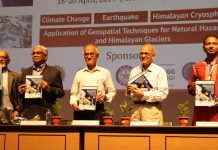 Ø DST- IITM Centre for Sustainable Treatment, Reuse and Management for Efficient, Affordable & Synergistic Solutions for Water (Water-IC for SUTRAM of EASY WATER). The DST-IITM-KGDS test bed on Solar thermal desalination solutions, coordinated by Prof. T. Sundararajan, Department of Mechanical Engineering, IIT Madras, is being established by IIT Madras and Empereal KGDS as solution providers in Naripaaiyur, Ramanathapuram District, Tamil Nadu with the aim to deliver customized technological solutions to address prevalent water challenges in the arid coastal village located on the shores of the Bay of Bengal. The facility is being set up at a cost of Rs. 3 crore to demonstrate the Solar powered Forward Osmosis in this coastal village to benefit approximately a population of 10,000 who face severe drinking water scarcity. This test bed will aid developing and demonstrating the technology to produce high quality drinking water from sea water for the benefit of local people utilizing Forward Osmosis.